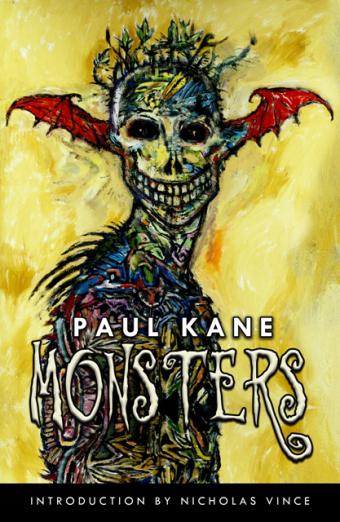 My name’s Paul Kane and incredible as it might seem, especially to me, I’ve been writing professionally now for almost twenty years. In fact, SST publications are bringing out a ‘Best of’ collection next year to mark the event called Shadow Casting, which will feature stories that have won awards, been in ‘best of’ anthologies and made into film/TV. I’ve written everything from genre journalism, which is where I cut my teeth, to Comedy, Crime and Science Fiction – technically, my best known books are SF as they’re post-apocalyptic reworkings of the Robin Hood mythos. But at heart I’m a horror writer, I guess. In terms of the formats I like to write in, as well as shorts and novelettes, novellas and novels, I absolutely love scriptwriting – TV and movies, but also more recently graphic novels. I wrote a 100 page one of those over the summer and had a blast. What was the first horror story you read and what kind of impact did it make on you? I don’t know if you could call it horror, and it was read to me at an early age before I started reading it over and over myself, but the story was Enid Blyton’s ‘The House in the Fog’. It’s a weird little tale where this boy gets lost in – surprise, surprise – some fog and wanders into this mysterious house where strange things happen. I remember him growing a furry tail at one point, which I suppose was my first exposure at a tender age to Body Horror. I just couldn’t get enough of that story, and kept pestering my granddad to read it to me again and again. I’d say that was largely responsible for putting me on this path towards writing imaginative stories myself. Oh, all kinds – way too many to list here. I went through a period growing up of reading everything SF, Fantasy, Crime and Horror related – which I call my ‘real’ education. I absolutely adore the Dune books by Frank Herbert, Ray Bradbury’s writing and Arthur C. Clarke. Colin Dexter was my go-to guy for crime growing up – the Morse mysteries were superb. And of course people like Tolkien for fantasy… In terms of horror, the authors who had the most impact on me during this period were James Herbert, Stephen King, Anne Rice, Ramsey Campbell, Shirley Jackson, Richard Matheson, Graham Masterton – the usual suspects in other words. Then later, people like Neil Gaiman, Christopher Fowler, Poppy Z. Brite, Simon Clark, Michael Marshall Smith – I could go on all day. But the author who has influenced more than any other and continues to do so is Clive Barker. Anyone who knows me and my work will understand the importance of him and his fiction, his plays, his films and artwork. Clive’s Books of Blood came along at just the right time for me, and were a revelation – if you’ll pardon the expression. They blew me away! Their range and scope, and just the beauty of the writing. Then I read ‘The Hellbound Heart’ and saw Hellraiser, and the die was pretty much cast. I’m very lucky in that over the years Clive has become a friend and I’ve worked with and for him on a number of projects – just last year I had the pleasure of adapting ‘In the Hills, The Cities’ into a motion comic script – and not many people get to say that about the people they read and loved during their formative years. Monsters from Alchemy Press is your 10th print collection and contains stories that cover a career of almost twenty years of publishing. What is it about the short fiction form that appeals to you? But anyway, they’ll always have a special place in my heart because they’re what got me the attention initially, and I do still love to write them, especially in-between novels or novellas. I think one author once said – it might even have been Stephen King – it’s like the difference between a kiss and a full blown relationship, and that’s true for a reader and a writer. Shorts also allow you to experiment a little more without worrying too much if it doesn’t work out; you haven’t wasted too much of your time if they don’t. They also let you explore lots of different aspects of life in various ways, using an assortment of techniques, which you might not be able to do in a novel because you’re trying to keep this whole juggernaut going and on track. Which of your short fiction are you most proud of? That’s a tough one, because it’s like asking you to choose between your children. I suppose I’ll go with the ones that other people liked the most: the award-winning ‘A Chaos Demon is for Life’; ‘Rag and Bone’ which appeared in The Mammoth Book of Best New Horror; ‘The Weeping Woman’, which was turned into a short film… All three are in Monsters coincidentally, and the limited edition hardback comes with a free DVD of that movie, directed by award-winner Mark Steensland, starring Fright Night’s Stephen Geoffreys and with music from legendary Fulci-collaborator Fabio Frizzi. And are there shorts by other writers that have stuck with you? Definitely, but again too many to list. However, I will mention ones like: Chris Fowler’s ‘Hated’ from the collection Flesh Wounds, about a man who is on the receiving end of a hate curse; Simon Clark’s ‘The Burning Doorway’ in which a crematory attendant sees figures get up and create a door to paradise inside a furnace; Robert Shearman’s ‘Mortal Coil’ where everyone is told when and how they will die; Ray Bradbury’s ‘The Homecoming’ about monsters at Halloween, which influenced my recent short ‘Michael the Monster’ from A Darke Phantastique; Neil Gaiman’s retelling of The Three Billy Goats Gruff ‘Troll Bridge’; a bit of cheat as it was in the anthology we edited, Hellbound Hearts, but Sarah Pinborough’s ‘The Confessor’s Tale’; and then of course a Clive one – and I’ll go with ‘Human Remains’ here, as that’s always stayed with me since I first read it. The perfect meditation on what it means to be human and how we should be grateful to be alive in the first place. As I say, there are tons of others, but we’d be here all year. 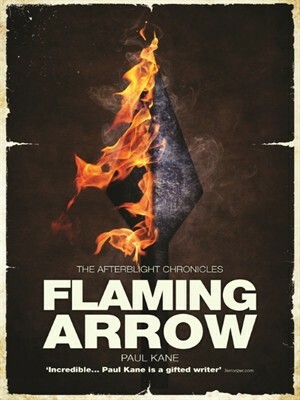 You’ve also recently published Flaming Arrow, the fourth contribution to your Arrowhead series in Abaddon’s Afterblight world – what was it like returning to the series and what can we expect from this new instalment? That came about after the omnibus edition of the three Arrowhead novels – Hooded Man – sold out of its first print run incredibly quickly. It coincided with me thinking about what might have happened to the characters I wrote about a few years down the line, and so when new Abaddon editor David Thomas Moore dropped me a line and said did I want to pen a new novella in that universe, I already had a story half-forming in my mind and jumped at the chance. It was actually a little like slipping on a pair of comfortable slippers again, because I’d already written close to a third of a million words about these people and their lives. Anyone who’s seen Hooded Man knows it’s a doorstopper of a book! Picking up the tale several years after Arrowland gave me the chance to examine things like the generation gap in a way I hadn’t before, with Robert now an older more grizzled Hood, thinking about handing over control of his Rangers to his adopted son, Mark. But, of course, things don’t go anywhere near according to plan and we see chaos erupting at home in Britain. At the same time, Robert is on a tour of Ranger stations abroad and finds himself facing a new kind of foe; genetically engineered monsters this time, which allowed me to do a tighter, siege-like story, in contrast to all the huge battles I’d tackled before. All in all I had a whale of a time writing it, and from the reviews so far people seem to be having just as much fun reading it. Clive Barker calls you the resident expert on Hellraiser and Peter Atkins goes further and calls you the world’s leading expert on this iconic series – how did you discover Hellraiser and what’s the appeal of it for you? As mentioned, I came across Clive’s fiction first, reading ‘The Hellbound Heart’ in the anthology Dark Visions, edited by George R.R. Martin. Then I remember seeing this video in local stores which had a picture of a guy with all these nails banged into his head on the cover, stupidly not connecting the two until I started to read the blurb. I wasn’t old enough to see Hellraiser at the cinema and couldn’t even buy the video myself – I think I borrowed it from a friend’s brother initially – but I recall being desperate to see it! When I did, it scared the crap out of me, naturally, but at the same time I could see that something else was going on. The story was layered, the effects were excellent – I mean just look at Bob Keen’s Frank; it’s amazing and still holds up today – and you had this new way of summoning demons through a kind of Pandora’s Box. The Cenobites themselves were a particular highlight for me, they were just so unique. Nobody had ever done them as these ‘magnificent superbutchers’ – as Clive describes them – before. In the past they’d been all horns and scales, or demon babies. Basically, it just had the whole package and I fell in love with the film and the mythology instantly. It’s also one of those mythos that can just expand and expand, as the sequels and comics and our anthology have shown. There’s a reason it’s still as popular as ever almost thirty years after the original. You’ve also edited anthologies – do you find the experience has sharpened or changed your approach to writing? Editing anthologies, like teaching creative writing classes – which I used to do up until a few years ago – definitely help with your own writing. They help you to spot mistakes and on the flip side see how good stories are constructed. You have a distance there with other people’s stories that you don’t have with your own, so it kind of trains you to do that when it comes to editing your own stuff. You end up approaching it objectively, especially if you put it to one side for a little while before coming back to it. Both help to sharpen your own writing, forcing you to look harder at stories, to spot what’s good and what’s bad – but also to help with your own judgement about such things. I’ve loved editing anthologies, from the very first in the small press to mass market ones later on such as The Mammoth Book of Body Horror and Beyond Rue Morgue. It’s a real treat for me and a change of pace from working on my own material, which keeps everything fresh. Do you have a dream anthology you’d like to do but haven’t yet? I do, and funnily enough I got very close to doing it last year. There were lots of phone calls backwards and forwards to the US, but in the end it didn’t happen. I never say never, though, so I don’t want to mention what it is in case it ever comes around again. For a little while back there, though, things were incredibly exciting. And how have you found the process of co-editing with Marie? Oh, I thoroughly enjoy it. Marie and I have very similar tastes in fiction, as in everything else. I can’t think of anything better than working with your best friend, apart from – of course – being married to her, so I count myself incredibly lucky in every respect there. I’ve edited anthologies on my own, but do prefer to have another set of eyes on the case, whether it’s Marie or someone else, as you can go a bit wordblind. Plus which, other people bring different things to the table. Charles Prepolec, for instance, was perfect for a project like Beyond Rue Morgue and I knew this because he’d edited my story ‘The Greatest Mystery’ for his Holmes anthology Gaslight Arcanum. Having said all that, I’ve just put an anthology to bed that I worked on by myself, but that’s a rather unusual case… and I can’t say too much about it at this time. Blimey, I’m probably the wrong person to ask that as I love all the clichés, good and bad. Vampires that turn into bats, werewolves howling at the moon, cobweb-filled castles, mad scientists, shambling zombies. I’m a sucker for all of that stuff. Maybe cats jumping out at people who are going down dark corridors – that’s probably had its day. I’d like to see a badger jump out at someone or something, that would make it a bit different. And finally, what are you up to next? It’s been one of the busiest times I can remember actually. 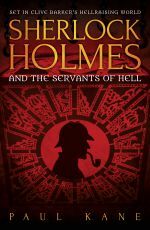 You catch me as I’ve just finished writing the first draft of a mass market novel (the only just announced Sherlock Holmes and the Servants of Hell for Solaris . So it’s been writing that and the graphic novel over the summer, as well as going to various conventions, like Edge-Lit and Derby Literary Festival. Other releases out or due out include: the latest Dalton Quayle from Pendragon, The Bric-a-brac Man, which contains two new comedy horror novellas; Hellraisers, which is an interview book from Avalard featuring brand new chats with all the major players in the franchise; the sequel to RED, Blood RED – also from SST – which contains both the original novella, the brand new short novel and a host of extras, such as an extract from the award-winning screenplay based on RED, character sketches and so on… that comes with a Dave McKean cover and an introduction by Alison Littlewood; the graphic novel of Lunar – which is also being turned into a feature film by The 7th Dimension director Brad Watson, based on my script; plus a new collection called Disexistence which gathers together a lot of my new shorts from the last few years, introduced by Nancy Holder… There’s more, but that’ll do for now! As for upcoming appearances, I’ll be at FantasyCon in October doing stuff and plugging stuff, and one of the guest speakers in November on a course in Derby called ‘The World of Writing and Publishing’, where I’ll be talking about how to make your living as a writer. Thank you for joining us Paul! 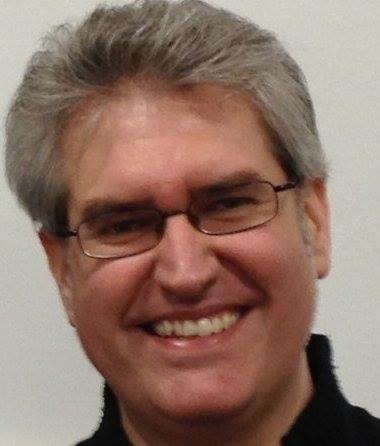 Paul Kane is the award-winning, bestselling author and editor of over fifty books – including the Arrowhead trilogy (gathered together in the sellout Hooded Man omnibus, revolving around a post-apocalyptic version of Robin Hood), The Butterfly Man and Other Stories, Hellbound Hearts and The Mammoth Book of Body Horror. His non-fiction books include The Hellraiser Films and Their Legacy and Voices in the Dark, and his genre journalism has appeared in the likes of SFX, Rue Morgue and DeathRay. He has been a Guest at Alt.Fiction five times, was a Guest at the first SFX Weekender, at Thought Bubble in 2011, Derbyshire Literary Festival and Off the Shelf in 2012, Monster Mash and Event Horizon in 2013, Edge-Lit in 2014, plus HorrorCon and HorrorFest in 2015, as well as being a panellist at FantasyCon and the World Fantasy Convention. His work has been optioned and adapted for the big and small screen, including for US network television, plus his latest novels are Lunar (set to be turned into a feature film) and the Y.A. story The Rainbow Man (as P.B. Kane), with the sequel to RED – Blood RED – forthcoming from SST Publications. He lives in Derbyshire, UK, with his wife Marie O’Regan, his family and a black cat called Mina. Find out more at his site http://www.shadow-writer.co.uk which has featured Guest Writers such as Stephen King, Neil Gaiman, Charlaine Harris, Dean Koontz and Guillermo del Toro. You can buy Monsters from Amazon here and Flaming Arrow from Amazon here or direct from Rebellion here. This entry was posted in interview and tagged abaddon books, alchemy press, flaming arrow, interview, monsters, paul kane, pendragon press, solaris books, sst publications. Bookmark the permalink.